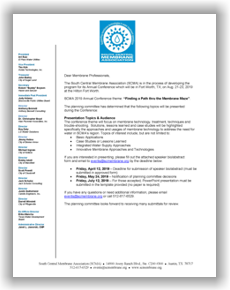 The South Central Membrane Association invites you to join your colleagues and associates in promoting membrane technology in water treatment operations. Membrane technology is the future of water treatment and SCMA continues to work tirelessly to bring valuable information to our members. Day One at the Annual Conference, the event begins with Keynote Speaker: Kelley Neumann with a talk on Extreme Water Management. This will be followed by an Overview of RO/NF basics, as well as MBR, Chemicals, and Energy Recovery Devices. Day Two will begin with Case Studies in Water Treatment and then attendees can choose between two tracks, a track for Operators and one for Engineers/Consultants. Day Three offers a little something for everybody, with topics ranging from MBR and Water Reuse Case Studies to Emerging Technologies. You won’t want to miss the educational opportunity to learn how to improve the quality of water supplies through desalting, reuse, and other water sciences. Online Registration for this Conference is now closed. 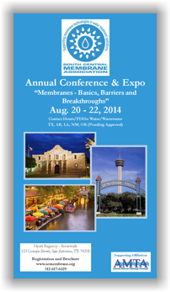 On-site registration will begin at the Hyatt Regency – Riverwalk at 9:00 a.m. on Wednesday Aug. 20th. Don’t miss the Best Tasting Membrane Water Competition on Thursday! To sign up to participate in the contest, please complete the entry form and submit by August 15, 2014. Make your lodging arrangements directly with the Hyatt Regency – Riverwalk by clicking the link or by phone at 888-421-1442. Refer to South Central Membrane Association (SCMA) for the discounted room rate negotiated for reservations made by July 30, 2014 (subject to availability).